The time-lapse animation covers 3.1 hours of the comet's path along its orbit (Dec 10 2018 UTC). Finally comet 46P/Wirtanen is large and bright enough to show up in a nightscape style image. It is also visible to the naked eye form a dark sky location and looks like a diffuse star cluster. Hope you can catch it before the Moon becomes too bright this month. The image of ASKAP radio telescope I took for CSIRO is on the cover of Nature Astronomy journal focussing on Fast Radio Bursts (Volume 2, Issue 11, 2018)! The orange glow in the Phased Array Feed at the focus point is the reflection of the setting Moon, hidden behind the pedestal. Mars and Eclipsed Moon in the first twilight. It was really special to see both the Red Planet and red Moon just as the first rays of twilight hit the sky above the Southern Ocean. This photo comes really close to the view through wide field binoculars. I hoped for clear skies above the Mornington Peninsula for the Lunar Eclipse of the century because I really wanted to catch the red light path on the water cast by the Blood Moon. Despite multiple disasters that morning, I managed to get this image during the astronomical twilight. Very bright Mars is above the Moon. Jupiter, Venus and Orion rise above the Church of Good Shepherd at Lake Tekapo, New Zealand. When I was waiting for the planets to rise in the early morning twilight I cursed the fog which was too thick to see anything. But just at the right moment it thinned a bit and added colours to the stars in this eerie scene. 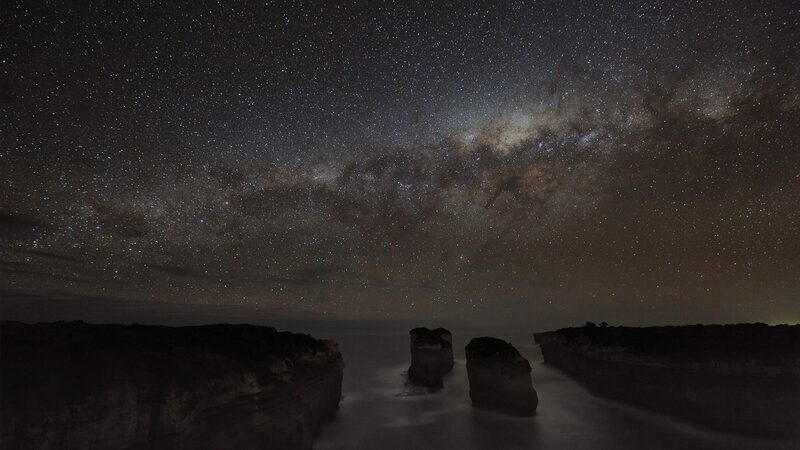 Our Milky Way Galaxy rises behind Cape Schanck on Mornington Peninsula, Australia. The lighthouse, built in 1859, is gently illuminating the cape. I took this image a few years ago and unfortunately the scene looks much brighter now, after the upgrade to a super-bright LED beam light on the lighthouse. Our Milky Way Galaxy rises behind a stunning Cherenkov light detector dish, part of MAGIC telescope on La Palma, Canary Islands with a "twist" at the end of the video. LaPalma is one of the best locations on Earth for astronomy with dark and clear skies above the clouds on top of a volcano. I shot this timelapse sequence in 2012 at Roque de los Mucachos observatory where I was collecting the prize for STARMUS astrophotography contest. I was really lucky that the telescope was not operational due to the computer system upgrade andI could get close enough with my Nikon D700 and 14-24 lens. The camera was panning slowly on Vixen Polarie tracker but the batteries ran out just after halfway through the sequence. With another bit of luck it stopped just in the right spot in the frame and created an opportunity for some nice additive star trails. Stars and the Milky Way reflect in the ocean beach and salt lakes in Victoria, Australia. I thought my telephoto shots of the total lunar eclipse in January were ruined by the thin high clouds. But the cloud veil helped in this image, which somewhat mimics the "diamond ring" effect seen during the total solar eclipse. It is soft and partially overexposed but I thought it looked atmospheric. A time lapse animation of the January 2018 Total Lunar Eclipse from the Grampians, Victoria, Australia. Just over 2.5 hours of the eclipse from a mountain top enhanced by thin clouds. It was a great visual experience too!